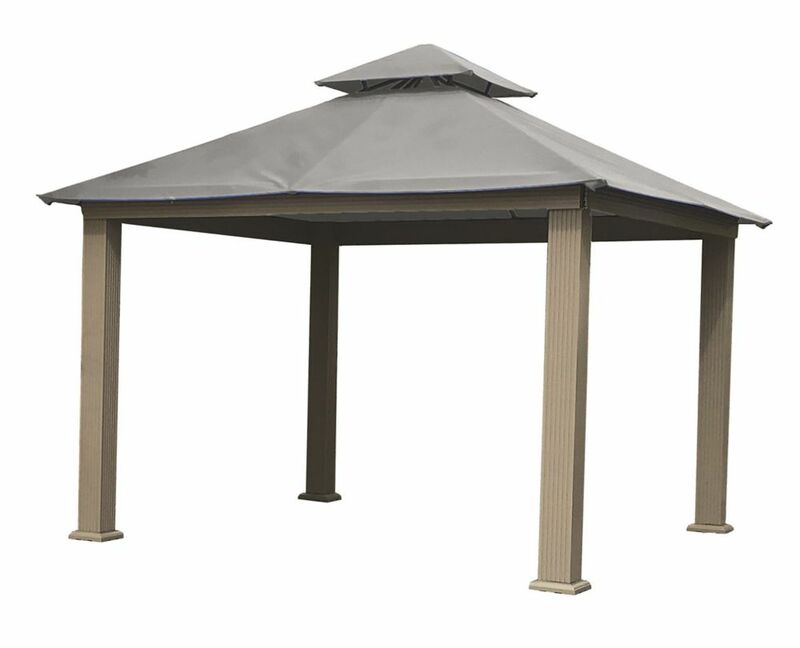 Complete your gazebo with this attractive cupola. Intricately carved cedar base. Copper colour metal roof with decorative wooden finial top. Hardware and cutting template included with instructions. Not available in Quebec Market. Available in store by Special Order Only. See associate for details. Easy to assemble, this planter box fits between the posts of your 10 ft. x 10 ft. or 12 ft. x 12 ft. pergola, helping to differentiate spaces and making it simple to add beautiful garden elements to any patio. Add plants to attract butterflies, detract mosquitos, create privacy, add colour, or easily grow vegetables close at hand. 12 ft. Sq. Gazebo -Mist Gray The ACACIA Gazebo program offers the enthusiast the ability to extend their covered living area. Our rust free Structural Extruded aluminum frame will last a lifetime. The Electrostatic finish makes the frame even more durable and attractive. The electrostatic finish actually sends an electric charge through the paint and the frame to help cause a chemical (ionic) bond, much stronger that simple powder coating commonly found in imported versions. From our quick assembly sculpted heavy-duty legs that can support over 1000 lbs. each to our unique frame design. We use Sun-DURA branded solution dyed polyester fabrics from Glen Raven Inc. Our factory precision laser cuts each of the canopy tops for the best fit. With 19 total colours available, we are sure that there is a colour to match your exterior and your needs. With a simple design, the canopy can be easily removed during winter months, extremely windy conditions, or for cleaning.